Became the youngest ever World Champion in 2005 (beaten by L Hamilton 2008), 24 years and 58 days, 2nd youngest to start a GP and the youngest to have won a GP. Had a 3 year deal with McLaren but left after 1 year 2007. 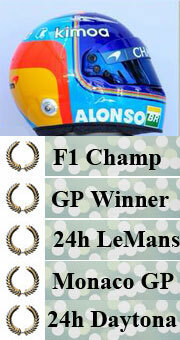 Fernandos 25th GP win was his first "perfect results/Grand Slam" pole, leading every lap, fastest lap and win. Led the INDY500 2017 for 7 laps and was in a position where he could have won the race when he retired with only 21 laps to go.